Tanamera Post Natal Care Set has been designed according to traditional Malay after birth therapies, which have helped new mothers cope with the stress after delivery for hundreds of years. 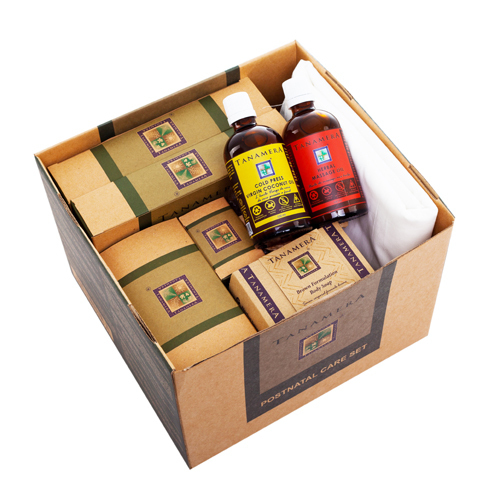 Such traditional products are a ritual, as they help soothe and calm the mind, which enhances recovery. The elements of each product are 100% formulated from plant-based ingredients. Tanamera Post Natal Care Set offers a comprehensive, and convenient, solution to your after birth care. Feminine Herbal Wash - A mixture of aromatic herbs, rich in essential oil used for healing stitches and keeping the genital area clean, deodorized and cool. The sooner you start using this product the better, even if you have had a cesarean birth. Herbal Tea - A warming tea that helps a mother with recovery from childbirth by stimulating internal circulation and expulsion of blood clots. Herbal Massage Oil - An all natural oil that is infused with tropical herbs that re-starts a mother’s internal circulation. Cold Press Virgin Coconut Oil - A key benefit of VCO is that it’s high in antioxidants which protect your skin from free radical damage. It can be used prenatally for stretch mark prevention as well as postnatally for fading of existing stretch marks, apply 2x per day. For best results apply after bathing and massage into wet skin. Brown Formulation Body Soap - A combination of herbs and grains produce a grainy surface that gently removes dead skin. Herbs such as turmeric, wild ginger and cinnamon are known to improve one’s overall skin condition. The exotic, earthy scent of patchouli oil is added for an aromatherapy effect. Boreh Body Scrub - A combination of herbs with warming properties whose main function is to have a warming effect on the skin and muscles to energize and rejuvenate a tired mother’s body. Calming Herbal Blend Paste - A traditionally blended paste that refreshes tired eyes and mind due to lack of sleep or stress. Firming Herbal Blend Paste - A traditional paste made of a blend of herbs used to help strengthen and firm stomach muscles from the inside out. Use with the postpartum abdominal wrap for more effective results. Binder - The material is made of unbleached cotton which is soft yet durable for hours of comfort. The wrap is easy to put on and most comfortable when worn under loose clothes. A postpartum wrap is an important recovery devise used in many cultures for a faster recovery from child birth.